Implementing a proper Spill Prevention Control & Countermeasure plan (SPCC) helps create a safe and productive work environment for your employees. With that in mind, we’ve recently added a broad-reaching Brady Absorbents Department to QSource.com. OSHA and EPA regulations (29 CFR 1910.22(a)(2), 40 CFR 112.7(c)(1)(vii), and 29 CFR 1910.120(j)(1)(vii)) require specific spill control and cleanup procedures to protect employees. The cost of non-compliance can be devastating in a number of ways. 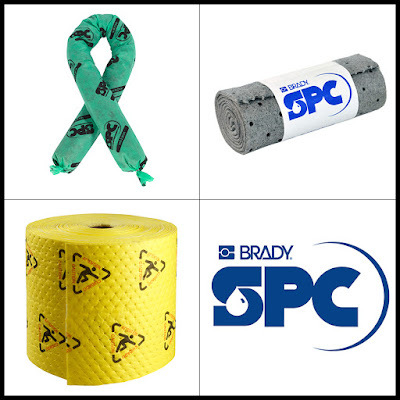 Brady’s SPC product line offers hundreds of spill control solutions for your workplace so you can avoid those costly cleanups. When creating your SPCC plan, you need to consider three main factors. What Type of Absorbent Application? What Size & Weight Do You Need? Visit QSource.com’s Absorbents Department to start building your SPCC plan. If you have questions about what your specific work area requires, you may contact us by phone (800-966-6020), email, or via our Web site. We also offer a complete line of Brady Labeling and Identification products.